Iran Air, branded as The Airline of the Islamic Republic of Iran (Persian: هواپیمايی جمهوری اسلامی ایران‎‎ Havâpeymâyiye Jomhuriye Eslâmiye Irân), is the flag carrier airline of Iran and the oldest airline in the Middle East, operating services to 58 destinations. The airline's cargo fleet, operated by subsidiary Iran Air Cargo, operates services to 20 scheduled and 5 charter destinations. Its main bases are the Tehran Imam Khomeini International Airport for international flights and Tehran Mehrabad Airport for domestic flights . It is headquartered on the grounds of Mehrabad Airport in Tehran. Iran Air transports 6 million passengers annually. Iran Air is also referred to by its Persian acronym, Homa (Persian: هما‎‎), which is derived from two sources: the initial letters of Iran Air's pre-Revolutionary Persian name, Havâpeymâyiye Melliye Irân (Persian: هواپیمایی ملی ایران‎‎); and from Homa, a mythical Persian griffin. In May 1944 Iranian Airways was founded at the initiative of business leader and politician Reza Afshar, in partnership with Gholam Hossein Ebtehaj. Not long after its formation, Afshar, who had previously formed Iran Tour, the first Iranian travel and tour agency, and Mehrabad Airport, became the sole owner of the private company. "Iranian Airways" flew its first passenger flight after World War II from Tehran to Mashhad, followed by Esfahan, Shiraz, Bushehr, and Zahedan. In 1946 the airline established service to Cairo, Baghdad and Tel Aviv, and in April 1947, to Paris. Within a period of 17 years, from 1945 to 1962, the airline developed into a major domestic carrier with a few international flights per week. Operations covered domestic and regional passenger and freight services plus a weekly freight service to Europe. The fleet consisted of Douglas DC-3s initially, supplemented by Douglas DC-4 and Vickers Viscount aircraft, later on. In 1954, the privately owned airline Persian Air Services (PAS) was established by Ahmad Shafiq. PAS initially operated only freight services, followed by passenger operations between Tehran and other major cities in Iran. In 1960, PAS initiated service to several European destinations, including Geneva, Paris, Brussels and London, using Douglas DC-7C aircraft, leased from Sabena. On 10 February 1961, the board of ministers ratified a state-sponsored proposal to establish a national airline; Iranian Airways was nationalized the same year. On 24 February 1962, Iranian Airways and PAS merged to form the Iran National Airlines Corporation, known as "Iran Air", using the "HOMA" bird as a symbol. HOMA was a public sector venture that combined the assets and liabilities of the two predecessor air carriers. Among the aircraft used were Avro Yorks, Douglas DC-3s, Douglas DC-6s and Vickers Viscounts. The carrier became a full member of the International Air Transport Association (IATA) in 1964. In 1965, Iran Air took delivery of its first jet aircraft, the Boeing 747 and the Boeing 727-100, followed by the Boeing 737–200 in 1971, the stretched Boeing 727-200 in 1974 and three variants of Boeing 747s (747-100, −200 and SP), starting in 1978–1979. By the mid-1970s, Iran Air was serving cities in Europe with non-stop and one-stop flights, including over 30 flights a week to London alone. On 8 October 1972, Iran Air placed an order with British Aircraft Corporation for two Concorde supersonic jets, plus one option. One was leased for a few flights from Tehran to Kish Island, but never appeared in Iran Air Livery. These orders were cancelled in April 1980, in the wake of the Iranian Revolution, making Iran Air the last airline to cancel its Concorde orders. On 29 May 1971, the Tehran to New York City route was inaugurated, first with Boeing 707s, making a stop-over at London Heathrow Airport. Shortly thereafter, the route was converted into a non-stop flight using Boeing 747SPs, making Iran Air the second Middle Eastern carrier (after El Al), to offer non-stop service to New York. With this flight, Iran Air set a new world record in time and distance for a non-stop, scheduled long-haul flight (12 hours and 15 minutes, 9,867 km – 6,131 mi – 5,328 nm). In 1978, the airline acquired six Airbus A300 aircraft for use on its domestic trunk and busy regional routes. By the end of that year, Iran Air was serving 31 international destinations stretching from New York City to Beijing and Tokyo. Plans were made to offer direct services to Los Angeles and to Sydney, for which the airline's long range Boeing 747SP aircraft were ideally suited. This would have allowed Iran Air to use Tehran as a midway point between East and West, because of its home base's favorable geographical location. Such plans were never realized. By the late 1970s, Iran Air was the fastest growing airline in the world and one of the most profitable. By 1976, Iran Air was ranked second only to Qantas, as the world’s safest airline, having been accident free for at least ten consecutive years. Although both airlines were accident free, Iran Air came second only because of fewer operational hours flown compared to Qantas. Prior to this ranking, a fatal accident had occurred on 25 December 1952, in which 27 of the 29 passengers on board perished when their Douglas DC-3 crashed on landing. In the wake of the Iranian Revolution in February 1979, Iran Air began to reorganize its international operations, discontinuing service to a range of foreign destinations. Tehran was designated as the only official gateway to Iran, while Shiraz could be used as an alternate, only in case of operational requirements. All other cities in Iran lost their international status. However, in recent times, many of Iran's major city airports have regained a minor international status. These direct international flights using airports in other major Iranian cities currently serve regional countries. The last departure from New York was on 7 November 1979. The last scheduled flight from Tehran to New York City on 8 November 1979 was diverted at the last minute to Montreal, prompted by an embargo suddenly imposed by the U.S. government following the occupation of the US embassy in Tehran by revolutionary students (Iran hostage crisis). Subsequently, the Boeing 747SPs were used on the airline's European and Asian routes. After the start of the Iran–Iraq War in September 1980, Iran Air's domestic and international operations were often subject to cancellation and irregularity, in line with the wartime situation. This continued until August 1988, when a cease-fire agreement took effect. Right from the start of the Iran–Iraq War, Abadan, the gateway to Iran's oil-producing region, lost all its air links, because the airport had to be closed. The year 1981 saw the formal name of the airline changed to "The Airline of the Islamic Republic of Iran". Iran Air carried 1.7 million passengers in that year. In 1990, the first of six Fokker 100 jets was added to the fleet and five more were added later on. In 2001, the airline bought six second-hand Airbus A310 aircraft (five −200 and one −300 series), since the U.S. authorities blocked the planned purchase of any new Airbus A330 units. In 2005, the carrier bought two used Airbus A300-600s. In the wake of the growing tension, between the U.S. and Iranian governments, over Iran's nuclear program, the plan to supply Boeing spare parts or aircraft, to upgrade the aging fleet of Iran Air, was blocked by the USA and members of the EU. However a new agreement between Iran and the United States at the end of 2006, has changed that and allowed an overhaul of Iran Air's fleet. The airline is wholly owned by the Government of Iran and has 7,500 employees. On 5 July 2010, an aviation official of Iran accused the U.K., Germany and the United Arab Emirates of refusing to refuel Iranian passenger jets. This move followed unilateral sanctions imposed by the US over the nuclear weapons dispute. Iran Air and Mahan Air both claimed to have been denied refuelling. A spokeswoman for Abu Dhabi Airports Company (ADAC) said that there is a contract with Iranian passenger flights to refuel and ADAC will continue to do so. A spokesperson for the United Kingdom Civil Aviation Authority said that it is the sole decision of independent suppliers if planes are to be refuelled or not. Germany's Transport Ministry said the refuelling of Iranian planes was not banned under EU or UN sanctions but did not say whether any independent refuellers were denying refuelling. Later in the day, Dubai revealed that they too continue to refuel Iranian passengers flights in and out of Dubai. The next day, a spokesperson for Iran said that no such limitation had been imposed. On 6 July 2010, it was announced that the European Commission would ban all of Iran Air's Airbus A320, Boeing 727 and Boeing 747 fleet from the EU over safety concerns. This move came as a major blow to Iran Air, limiting flights to Europe with its own aircraft. As a result of a move in March 2011, when a majority of the EU airports refused refuelling services to Iran Air, most of Iran Air services originating from Western Europe to Tehran’s Imam Khomeini International Airport started landing in Belgrade, Serbia in order to refuel. On May 22 Switzerland has also announced that it would stop the supply of Iranian airliners on their flights from Geneva. Following three months of refuelling operations, the Belgrade airport authorities gradually suspended the contract with Iran Air. Since this cessation of the contract, Iran Air aircraft operated technical stops in Minsk, Belarus and Kiev, Ukraine, en route to Tehran, forcing aircraft to make a significant detour from their original flight-path, especially if they were flying from Western Europe airports such as Paris. In 2012, the EU re-allowed the refuelling of Iran Air aircraft at secondary European airports such as Ljubljana and Budapest, in an effort to retain the refuelling contracts within the EU, rather than letting them go to Serbia or later Belarus and Ukraine. In January 2012, Iran Air's flights to and from London Heathrow operated with a fuel stop at Manston Airport in Kent. However, the airport announced in December 2011 that this arrangement was to an end and it would no longer refuel the company's aircraft. This announcement swiftly followed the closure of Iran's embassy in London as the consequence of the ransacking of the British embassy in Tehran. The airport stressed that it had not breached any trade agreements, as it had no connections with the USA. Technical stopover of an Iran Air Airbus A300B4-600R for refuelling during a London-Tehran flight, at Milan Malpensa airport. Until January 2016, Iran Air's flights from Western Europe usually had to make a stopover in Belgrade, Ljubljana and Prague en route to Tehran depending the flight's origin. However, following Iran's implementation of JCPOA (Joint Comprehensive Plan of Action) on 16 January 2016 and removal of refueling bans, the airline is now able to refuel in all airports. It has been reported that Iran Air has gradually resumed the refueling in Western Europe, resulting resuming of flights to Paris and Rome. On Friday 15 January 2016 US president Barack Obama has authorized his secretary of state, John Kerry, by signing a memorandum to lift the sanctions on Iran civil aviation. Following Iran's implementation of JCPOA (Joint Comprehensive Plan of Action) on 16 January 2016, all sanctions on Iran civil aviation were lifted. As the result, Iran is now able to purchase new civil aircraft from any manufacturer as well as refueling in Western Europe. On 16 January 2016 Abbas Akhoundi, The minister of Roads and Urban Development announced that Iran has reached to an agreement with Airbus group to buy 114 aircraft as a part of renovating Iran Air's aging fleet. The details of the order has not been announced yet, however it includes new and used aircraft such as a mix of A320 family and A340s. It is expected the ordered aircraft to be delivered as early as July 2016. Iran has also expressed its interest in other models such as: Boeing 777, 747-8, A350, A380 for its wide-body fleet and Boeing 737 for its domestic fleet. On January 28, the agreement was officially announced for 118 new aircraft, which are 21 A320ceo family, 24 A320neo family, 27 A330ceo family, 18 A330neo (-900), 16 A350-1000 and 12 A380, which will be delivered from 2016 until 2023. Iran Air is expected to sign a deal with Boeing along with either Bombardier or Embraer in the near future for more aircraft. On 24 January 2016 Tehran hosted the CAPA Iran Aviation Summit organised by CAPA - Centre for Aviation in order to bring both Iranian and international aviation authorities together for considering development plans for Iran's aviation industry. Based on CAPA research, the size of Iran's economy, on a PPP basis, sits somewhere between that of Turkey and Australia whose commercial airline fleets range between 500-600 aircraft. It was expected that Iran would increase its airliner fleet by some 300 to 500 aircraft within the next five to ten years and Iran Air's share of it to be something between 300-400 jets. It has been reported that an agreement between the airline and Airbus Group for purchasing of 118 jets to be signed during Hassan Rouhani's trip to Paris on the last week of January 2016. In another statement Farhad Parvaresh the CEO of Iran Air has announced that his airline is expect to spend some 3-5 billion USD on purchase of regional aircraft including Airbus, Boeing, Bombardier and Embraer. Bombardier Inc has already presented its regional models during CAPA summit in Tehran. According to Parvaresh, Iran Air intends to buy aircraft from both Boeing and Airbus however they have to bid for the sales themselves rather expecting the airline to approach them as the ambient of the market has changed. After all based on the figures it seems Iran air is ready to spend some $25-$50 billion USD on renovation within the next 5 to 10 years and an increment of its fleet size to well over 250 aircraft. On 14 June 2016, Minster of Roads and Urban Development Abbas Ahmad Akhoundi announced that Iran Air was nearing a historic deal with American aircraft manufacturer Boeing. After the Iran National Airline was registered as a national company, it officially started under the acronym "HOMA," made by combining initial letters of the Persian phrase. For both brevity and clarity, Iran National Airline changed to IranAir. To choose the logo, a logo competition announcement appeared in Kayhan and Ettelaat newspapers in 1961. Judges came from the College of Fine Arts. Inspired by an image atop one of the columns at Persepolis. Many people assert to have painted the logo. One of them is Edward Zohrabian. But he hasn’t any certificates for his statement. Another person who asserts to be the painter of the logo is Mr. Jamal Massah. Jamal Massah was a painter and was at this time a political prisoner. Sawak allowed him to send his design to the advertisement. He has done and won it. The most significant inspiration was Homa, the Persian mythological griffin, which can be found in prosperous Persepolis and described in the books of R. Grishman, the famous French archeologist who specialized in ancient Iran. The griffin atop the Persepolis column has three distinct characteristics: an eagle's head, a cow's ears and a horse's mane. Without legs, according to some accounts, the griffin never rests, living its entire life flying invisibly high above the earth, and never alighting on the ground. The color offered by the designer was turquoise. In 2013 the logo was selected as the most beautiful in the whole airline industry by Skift. Iran Air Cargo is the freight division of the airline. In May 2008, the airline acquired two Airbus A300B4F aircraft to resume its freighter operations, which were suspended after the grounding of its single Boeing 747-200F cargo aircraft. Freight is also flown with Iran Air's passenger fleet belly-hold capacity. Iran Airtour is a low cost carrier, based at the Mashhad International Airport (MHD) and was a subsidiary of Iran Air. Soviet-designed Tu-154M jets were the backbone of this airline, although Iran Air Tours has acquired a number of Airbus A300B4 and MD-83 aircraft on lease and in hybrid livery from Turkey, increasing its flights to domestic cities such as Mashhad, Zahedan and Ahvaz. Iran Air Tours initiated scheduled operations in 1990, taking over the bulk of the domestic services, formerly operated by Iran Air. Iran Air Tours has been responsible for the build-up of an extensive route network, focused on the northeastern Iranian city of Mashhad, home to the Imam Reza shrine, one of the holiest shrines of the Shi'a Muslims. Reservations for Iran Air Tours flights could have been made via the Iran Air system. The carrier also operates charter flights. Homa Hotel Group was a subsidiary company of Iran Air, which owns a chain of hotels in the major cities of Iran. Homa Hotels are located in Tehran, Shiraz, Bandar Abbas and Mashhad, where there are two hotels. All the hotels were constructed prior to 1979, with the exception of the second Mashad hotel, built in the late 1990s. The hotel group was established by the government, after the 1979 Iranian revolution and has more than 800 furnished rooms. Most of the hotels were under private control prior to 1979, but were nationalized soon after. The most famous of these was the Homa Hotel Tehran, which used to be the Tehran Sheraton, prior to being nationalized in 1979. 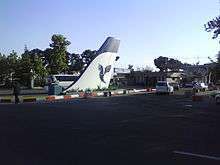 The Iran Air's headquarters and its Training Centre is located on the property of Tehran-Mehrabad International Airport in Tehran. Iran Air has offices in different cities across Europe and the Middle East including: London, Paris, Frankfurt, Amsterdam, Milan, Nicosia, Istanbul, Ankara, Muscat, Doha, Abu Dhabi and Dubai. Iran Air's London offices are currently in the London Borough of Hammersmith and Fulham. The airline moved there by Wednesday 4 January 2012. Iran Air previously had its Piccadilly main sales office in the City of Westminster. In 1992 protesters threw firebombs at the Piccadilly office. Iran air also has a ticket office in Heathrow Terminal 3. As of 2011 Iran Air still had a model of an Iran Air Concorde in the windows of the London office. It was due to operate the type but the order was cancelled due to the revolution. Iran Air's Netherlands offices are on Level 3 of Tower A of the World Trade Center at Schiphol Airport. Iran Air serves over 28 domestic and 30 international destinations. However, with the expected expansions during 2016, it is likely new routes and destinations will be served by the airline. These routes will mainly serve scattered Iranians across Europe, North America and Australia. The new destinations are expected to be in Australia, Europe, Canada and the United States. A growth in Domestic network is also expected as the airline is seeking regional aircraft from Boeing, Embraer, and Bombardier Aerospace. Hajj charter operations form a major part of Iran Air's annual activities. Every year, tens of thousands of pilgrims fly from major cities in Iran to Jeddah, Saudi Arabia's air gateway to Mecca, to take part in pilgrimage ceremonies. In 2001, Iran Air carried around 60,000 pilgrims to Jeddah, within a span of 40 days. 352 Hajj charter flights were operated from 17 cities in Iran. Iran Air also operates charter flights from cities in Iran to Jeddah, during the Umrah season. To deal with the operational requirements and to meet traffic demand, the airline leases aircraft including Boeing 747s and Airbus A300s. As a result of economic sanctions against Iran, Iran Air has been unable to expand and replace its fleet. In anticipation of a deal being reached for the lifting of sanctions, the chairman of Iran Air stated that the airline would then seek to obtain at least 100 widebody- and short-haul jets. In January 2016 Iran Air signed an agreement for 118 Airbus aircraft (21 Airbus A320s, 24 Airbus A320neos, 27 Airbus A330s, 18 Airbus A330-900neos, 16 Airbus A350-1000s and 12 Airbus A380s). The deliveries were set to begin as early as 2016 and are to be completed by the end of 2024, with the majority to be delivered by the end of 2020. According to Boeing and Iranian officials, Boeing has started preliminary talks with Iranian airlines, including Iran Air, to discuss the possibilities of selling services, parts and new aircraft. Three types of airliners, including the 787 Dreamliner, were presented during a two days meeting in Tehran, however no details were publicly released from either side. Boeing said in a statement that any future sale needs the approval of the U.S. Government. Lufthansa, the flag carrier of Germany, was also considering selling some of its Airbus A340s to Iran Air. In June 2016, Iran Air officially announced that it was in talks with Boeing for a possible order "close in size to the 118 Airbus aircraft agreement". On 21 June 2016 Boeing announced it has signed a tentative agreement to sell jetliners to Iran, in what would be one of the Islamic Republic’s biggest deals with a U.S. manufacturer since trade sanctions on Tehran were eased. Iranian Transport Minister Abbas Akhoundi told state television that the order could have a value of up to $25 billion which would include Boeing 777-300ER long-range jets, according to the Associated Press. On 23 June 2016 Reuters reported a provisional deal calling for Boeing to supply a total of 109 small and large jetliners worth $20.37 billion at list prices. The deal, which is yet to be approved by both governments, includes 80 aircraft worth $17.58 billion to be sold directly by Boeing, including 34 wide-body jets: 15 each of the 777-300ER and 777-9 models and 4 of the 747-8. It also includes the direct sale of 46 narrow-body jets: 40 of the upcoming 737 MAX model and 6 of the current 737 NG. Under the same provisional deal, Boeing will arrange for Iran Air to acquire a further 29 737NG aircraft through leases. On 26 June 2016, the Sunday Times of Sri Lanka reported that the government of Sri Lanka met Iran Air management and Iran government officials to renegotiate the orders for the three Airbus A350-900 aircraft ordered by SriLankan Airlines. Boeing 747SP 10 July 2016 Iran Air was the last commercial operator of this type in passenger service. Concorde  1975 On 8 October 1972, Iran Air placed an order with British Aircraft Corporation for two Concorde supersonic jets. These orders were canceled in April 1980, making Iran Air the last airline to cancel its Concorde orders. 3 July 1988: Iran Air Flight 655 was flying over the Persian Gulf on its way to Dubai from Bandar Abbas. According to the U.S. version of events, the USS Vincennes Navy cruiser mistook the airliner for an Iranian F-14 Tomcat and the cruiser shot the airliner down with a missile, killing all 16 crew and 274 passengers. Iran maintains it was an intentional act of barbarism. The United States called the incident a "mistake", although the Airbus A300 airliner was over 20 times larger in size than an F-14 jet, within close proximity to the ship's long range radars. Furthermore, the United States, through Vice President George H. W. Bush, expressed regret and promised to compensate victims, but that the money would not go through the Iranian government. Newsweek published a long article titled "Sea of Lies" that largely blamed Capt. Will Rogers, the Vincennes’ commander. 9 January 2011: Iran Air Flight 277, a Boeing 727-200 (registration: EP-IRP) originating from Tehran crashed near its destination city of Orumiyeh, 740 kilometres (460 mi) northwest of Tehran. It was carrying 105 people, of whom 77 survived. Bad weather conditions during landing led to a go around. 18 October 2011: Iran Air Flight 742, a Boeing 727-200 (registration: EP-IRR) originated from Moscow, landed with no nose gear at Mehrabad International Airport. Several failed attempts were made by captain Houshang Shahbazi in order to extend the nose gear by executing Positive-G maneuvers, before he finally managed to safely land the aircraft without casualties. ↑ "IranAir Portal". Retrieved 24 April 2015. ↑ "IranAir Portal". Iranair.com. Retrieved 2014-02-03. ↑ "Iran Chamber Society: History of Iran: The History of Iranian Air Transportation Industry". Retrieved 24 April 2015. ↑ IranAir Archived July 2, 2009, at the Wayback Machine. ↑ "وزارت راه و شهرسازي". Retrieved 25 June 2016. ↑ "طرح آزادسازی سهام عدالت نهایی شد/ تقاضای خارجی برای خرید ایران ایر". 4 February 2014. Retrieved 25 June 2016. ↑ "Directory: World Airlines". Flight International. 2007-04-03. p. 94. ↑ Iran/USA agreement Archived January 17, 2009, at the Wayback Machine. ↑ "Britain, Germany and UAE refuse to refuel Iran planes". Telegraph.co.uk. 5 July 2010. Retrieved 24 April 2015. ↑ "Iran says its passenger jets were refused fuel abroad". BBC News. Retrieved 24 April 2015. ↑ "Dubai airport continues to refuel Iranian planes". Retrieved 24 April 2015. ↑ "Iran rejects claim that planes were denied fuel". BBC News. Retrieved 24 April 2015. ↑ Reed Business Information Limited. "Latest EU blacklist bans Iran Air A320s and 747s". Retrieved 24 April 2015. ↑ "EU imposes flight ban on Iran Air over safety". BBC News. Retrieved 24 April 2015. ↑ "As of 2012 Iran Air refuels at LJU and BUD". Various photographers. 19 November 2012. ↑ "Manston airport stops refuelling Iran Air flights". BBC News. 1 December 2011. 1 2 "IranAir Official Site-IranAir_Portal-Iran Air Resumes Refueling in W. Europe". Retrieved 25 June 2016. ↑ "IranAir Official Site-IranAir_Portal-Announcement of IranAir restarts weekly flights to Rome". Retrieved 25 June 2016. ↑ "Obama lifts ban on selling passenger planes to Iran". Retrieved 25 June 2016. ↑ "Iran selects Airbus for its civil aviation renewal". Retrieved 25 June 2016. ↑ "CAPA Iran Aviation Summit opens in Tehran – huge opportunities ahead, with some challenges - CAPA - Centre for Aviation". Retrieved 25 June 2016. 1 2 Kamel, Golnar Motevalli golnarM Deena. "Iran Air Sees Adding 20 Regional Jets, as Bombardier Makes Pitch". Retrieved 25 June 2016. ↑ "The 30 Best-Looking Airlines Logos in The World". 23 October 2013. Retrieved 25 June 2016. ↑ "IranAir Cargo". Cargo.iranair.com. Retrieved 2014-02-03. 1 2 3 "Iran Airtour Airlines". Iranairtours.ir. Retrieved 2014-02-03. ↑ "تامین رفاه بازنشستگان با توسعه خدمات هتلداری". Retrieved 25 June 2016. 1 2 "Iran Air - Homa Hotel Group". Iranair.it. Retrieved 2014-02-03. ↑ "ارتباط با هما Archived June 23, 2012, at the Wayback Machine.." IranAir. Retrieved on 12 January 2011. "آدرس : تهران ، جاده مخصوص كرج ، بلوار فرودگاه ،ادارات مركزي هما ، ساختمان پشتيباني ، طبقه دوم ، اتاق 217" Archived June 23, 2012, at the Wayback Machine. ↑ "Contact IranAir Archived May 20, 2012, at the Wayback Machine.." IranAir. Retrieved on 12 January 2011. "Address: No.221,Second Floor, Public Relations, Support Services BLd., IranAir H.Q.,Mehrabad Airport, Tehran,Iran." Archived May 20, 2012, at the Wayback Machine. ↑ "IranAir moves to new offices." (Archive) Iran Air. Retrieved on 29 February 2012. "177–179 Hammersmith Road, London, W6 8BS" Archived March 20, 2012, at the Wayback Machine. ↑ "News from Iran Air." (Archive) Iran Air UK. Retrieved on 29 February 2012. ↑ "Ticket Payment Information." (Archive) Iran Air. Retrieved on 29 February 2012. "Iran Air Sales Office, 73 Piccadilly, London W1J 8QX" Archived March 1, 2011, at the Wayback Machine. ↑ "10 Iranian missions attacked." New Straits Times. Tuesday 7 April 1992. p. 14. Retrieved from Google Books (8 of 46) on 29 February 2012. ↑ "Contact Archived May 26, 2013, at the Wayback Machine.." Iran Air Netherlands. Retrieved on 29 February 2012. "World Trade Center Tower A – Level 3, Schiphol Blvd.191 1118 BG Schiphol The Netherlands" Archived May 26, 2013, at the Wayback Machine. 1 2 Kamel, Deena. "Iran to Buy 114 Airbus Jets, May Seek Boeings Post-Sanctions". Bloomberg. ↑ "Profile on Iran Air". CAPA Centre for Aviation. Archived from the original on 2016-10-31. Retrieved 2016-10-31. 1 2 3 4 5 6 7 8 9 "Iran Air Fleet Details and History". Planespotters. 18 November 2016. Retrieved 20 November 2016. Included in the fleet list are twelve stored Fokker 100s. ↑ "ATR signs a major agreement with Iran Air for 40 ATR 72-600s" (Press release). ATR Aircraft. 1 February 2016. Retrieved 25 June 2016. ↑ "Iran Air's first new ATR72s to arrive in November". ch-aviation.com. ch-aviation GmbH. 17 February 2016. Retrieved 25 June 2016. 1 2 Zhang, Benjamin (29 January 2016). "Airbus just sold Iran $25 billion worth of jets including a dozen A380s". Singapore: Business Insider. Retrieved 4 February 2016. ↑ Hepher, Tim (10 July 2015). "Planemakers poised for Iranian buying spree if nuclear deal reached". Paris/Vienna: Reuters. Retrieved 4 February 2016. ↑ "From the A320 to A380: Iran Air selects the full Airbus jetliner portfolio for its fleet modernisation". Retrieved 25 June 2016. ↑ "Iran Air's fleet order signals serious intent for the Iranian aviation industry". Centre for Aviation. Retrieved 25 June 2016. ↑ Ostrower, Jon; Wall, Robert (12 April 2016). "Boeing Meets With Iranian Airlines to Discuss Jets, Aircraft Services". Retrieved 25 June 2016 – via Wall Street Journal. ↑ Hofmann, Kurt (18 March 2016). "Lufthansa may sell A340-300s to Iran Air". Germany: ATW. Retrieved 18 March 2016. ↑ "Iranair could buy Boeing planes but any deal faces hurdles". euronews. Retrieved 2016-06-09. ↑ Wall, Robert (21 June 2016). "Boeing Signs Deal to Sell Jets to Iran's State Airline". Retrieved 25 June 2016 – via Wall Street Journal. ↑ "Boeing defends Iran jet deal as new details emerge". 23 June 2016. Retrieved 25 June 2016 – via Reuters. ↑ "Government negotiating with Iran Air to dispose of the 3 Airbus A350-900 | The Sunday Times Sri Lanka". www.sundaytimes.lk. Retrieved 2016-06-26. ↑ "Heritage Concorde". Retrieved 25 June 2016. ↑ International Court of Justice. Aerial Incident of 3 July 1988 (Islamic Republic of Iran v. United States of America) — Iranian submission: Part IV B, The shooting down of flight IR 655, para. 4.52–4.53. Accessed 2007-01-20. ↑ Military Blunders History.net Archived April 10, 2009, at the Wayback Machine. ↑ Barry, John; Roger Charles (1992-07-13). "Sea of Lies". Newsweek. ↑ "SEA OF LIES". Retrieved 24 April 2015. ↑ "Iran Air plane skids off runway, passengers safe". AFP. Retrieved 2008-01-05. ↑ "Accident description". Aviation Safety Network. Retrieved 20 November 2009. ↑ "Accident: Iran Air F100 at Isfahan on Jan 15th 2010, nose gear collapse on landing". Aviation Herald. Retrieved 17 January 2010. ↑ "Iran Passenger Plane "Crashes" Near Orumiyeh". BBC World News. Retrieved 9 January 2010. ↑ "Iran Air ace forced to land without nose gear (VIDEO)". Retrieved 25 June 2016.